(born 1959) – an artist, a photographer and a performer. In the 1980s, he was an active member of the Solidarity movement; during the Martial Law period (1981-83) he was sentenced to one and a half years of imprisonment for the distribution of underground brochures. He is regarded as a forerunner of the Polish critical art, particularly with regard to issues such as the queer aesthetics, corporeality and identity in its broad sense. 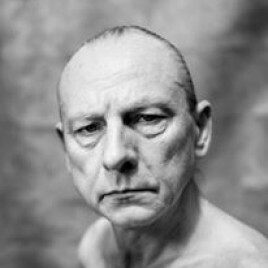 His best known works include, among others, documentaries Obrzędy intymne [Intimate Rituals] and Jak tresuje się dziewczynki [How Little Girls Are Trained], an installation Lego. Obóz koncentracyjny [Lego. A Concentration Camp] and a series of photographs Pozytywy [Positives]. Together with Darek Foks he wrote a book Co robi łączniczka [What A Female Liaison Officer Does]. In 2015, he debuted as a film director with Walser.